Justin Trudeau, who usually expresses his fake emotions with buckets of crocodile tears, is fulminating up a storm against Maduro’s “illegitimate dictatorship” responsible for ‘terrible oppression the likes of which South America has not seen in a very long time’ & for a massive refugee crisis. Maybe he doesn’t know about the US economic & military role in Chile, Mexico, Honduras, Guatemala, El Salvador, & Nicaragua that has sent hundreds of thousands of refugees fleeing north to the US. But contrast his vituperations against Maduro to his approach to Saudi Mohammed bin Salman who beheads & dismembers dissidents & has been bombing Yemen for almost four years. In a face-to-face exchange, Trudeau told bin Salman “better answers about the killing of Jamal Khashoggi are required.” How hard-hitting can you get!? He also “pushed” the issue of bombing Yemen to smithereens. Hard to push that issue too hard though since much of the heavy weaponry used by Saudi Arabia came from Canada. 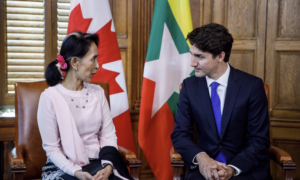 This photo of Trudeau with Aung San Suu Kyi was taken in June 2017 after the 2012 onslaught against the Rohingya people which sent tens of thousands fleeing for their lives; after the 2015 crisis where 25,000 Rohingya refugees fleeing in boats remain unaccounted for in the Andaman Sea; after the 2016 renewal of violence in Arakan state & the 2017 onslaught had already begun. We won’t blame Trudeau that it took Canada many months & hundreds of thousands more Rohingya refugees to revoke Suu Kyi’s honorary citizenship. But we do wonder why Trudeau, since he cares so much about human rights, has not pulled Canadian mining operations out of Burma or imposed sanctions on the country? Canada could also offer asylum to thousands of Rohingya but has only offered to take a limited number, including victims of sexual violence. Why limited since he cares so much about human & refugee rights? This is not a defense of Maduro but a protest against Trudeau’s war mongering & crocodile-tear hypocrisy. 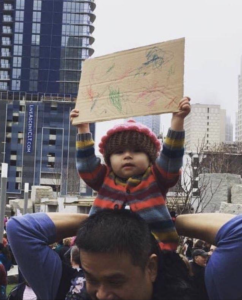 Teach our children young how to stand their ground against injustice & every form of social hatred. Teach them to love & respect the whole damn human race. Let that be our legacy. 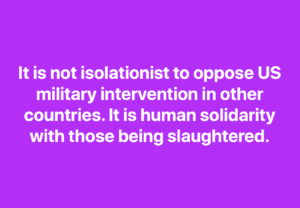 It appears that Stalinists, Assadists, libertarians, & confusionists are all on the same side as principled antiwar activists on the issue of US military intervention in Venezuela. It’s likely we will be rallying with them against US saber-rattling. That’s the chaotic nature of politics when you can no longer distinguish the left from the right. But what distinguishes our opposition to US war from theirs is that their concern is regime-change & ours is the carnage of war faced by civilians. We are not defending the repressive regime of Maduro; we are opposing US war against Venezuelans. It is up to them to settle their differences with the Venezuelan government. The US has no rights of any kind whatsoever to meddle in the affairs of another country. Stalinists, Assadists, et al, really aren’t concerned about the affects of war on civilians as we know so well from Syria where they glorify Assad & demonize civilians he gasses & barrel bombs as all ‘Wahhabi/Salafi jihadi terrorists’. Their sole concern is maintaining the power status quo in international politics with emphasis on supporting the most repressive regimes & vilifying protests against them as fascist. It isn’t possible to have a united antiwar movement with such reactionary political forces but it is possible to have united antiwar actions demanding “US hands off Venezuela.” Factionalism & differences even of such magnitude cannot deter us from opposing US wars. 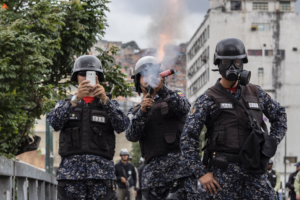 Photo is National Police in Caracas shooting tear gas at protesters. A group of 70 Latin America scholars & others have issued an open letter opposing US military intervention in Venezuela. The letter focuses on the regime change aspect of US saber-rattling. It is not the letter antiwar activists might write which would focus on the threat any form of intervention presents to the people of Venezuela but it is not a compromised letter. Several of the signatories are Assad supporters, including Noam Chomsky, John Pilger, Tim Anderson, Vijay Prashad, Medea Benjamin. Their signatures do not invalidate the letter or the importance of speaking out against the threat of US intervention. 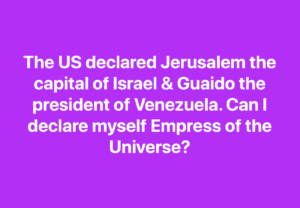 It is not, as it has been called, ‘apologia for Maduro’ although it is probable many of the signers hold uncritical views of Maduro. When opponents of the Assad regime call for a humanitarian US military intervention to save the Syrian Arab Spring uprising, they reveal their rightwing political character & allow Assadists to hijack the principles of opposition to war. When they oppose the Maduro regime, support a coup engineered by the US, & are cavalier about US military intervention, they show themselves to be utterly politically bankrupt. What have they missed in their political education that 150 years of US militarism has taught the entire rest of the world–especially the people of Vietnam, Cambodia, Laos, Philippines, Iraq, Somalia, Yemen, Libya, Granada, Panama, Nicaragua, Guatemala, Honduras, Syria, Palestine, Afghanistan, Bahrain, Egypt, Chile, Korea, South Sudan, Hawaii, Mexico, & other countries too numerous to mention? We mercilessly castigate Tim Anderson & his ilk when they support Assad, deny the Rohingya genocide, deny the Uyghur genocide, support Duterte’s vigilante war against the poor, call Kashmiris ‘jihadi terrorists’, & other such despicable things. We fully understand they support the repressive Maduro regime & don’t give a damn about the people of Venezuela. But if you focus on their signature on this letter rather than the threats of US military intervention, you show yourself to be on the wrong side of justice–in fact, on the side of a coup & US war against the people of Venezuela. Photo is an injured Venezuelan protester facing off against riot police. 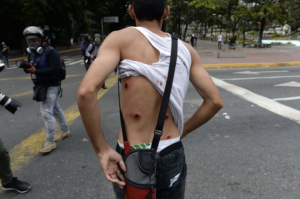 Once again it must be reiterated that the Maduro government has no more right to shoot rubber bullets or any other kind of ammo at unarmed protesters than the Assad regime has to bomb civilians or the US to invade Venezuela.